A few years ago, I realised that when we’re testing products with the general public, we’re actually doing a type of market research. So I joined the Market Research Society in the hope of making connections with other market researchers, and finding out how the user research techniques we use as part of user-centred design are viewed by the market research industry in general. I’ve found that their codes of conduct are good: thoughtfully written, carefully policed, and work well in practice. And I’ve enjoyed reading the monthly magazine. So this year I thought ‘time to go to the conference’ and took myself off to Birmingham for three days. Conference tip 1: always read the advance programme before you get there. Oops – I didn’t. So I pitched up at the time advertised on the conference joining instructions, 10:00am, only to find that the conference proper started at 13:00pm. At least I had plenty of time to decide what I wanted to go to. Conference tip 2: lug a laptop with a long battery life. The conference bag was nice-looking but light and oh, no: the proceedings were on CD-ROM. I chose my laptop for its big screen. Battery life is not its strong point. So, I was reduced to trying to make notes without any handouts. Actually, apart from these two little gripes the conference organisation was excellent. Conference tip 3: bring your toothbrush. The exhibition featured quite a good range of stands – mostly trying to sell me research, but including some interesting-looking survey design software and a gadget I couldn’t resist: a tiny audio recorder using flash memory. Also two great ideas: a ‘relaxation zone’ where you could get a head and neck massage or a drink of water, and a ‘meet the speakers’ area where speakers congregated after the sessions. Why the toothbrush? Because nearly all the give-aways were sweets or chocolate. 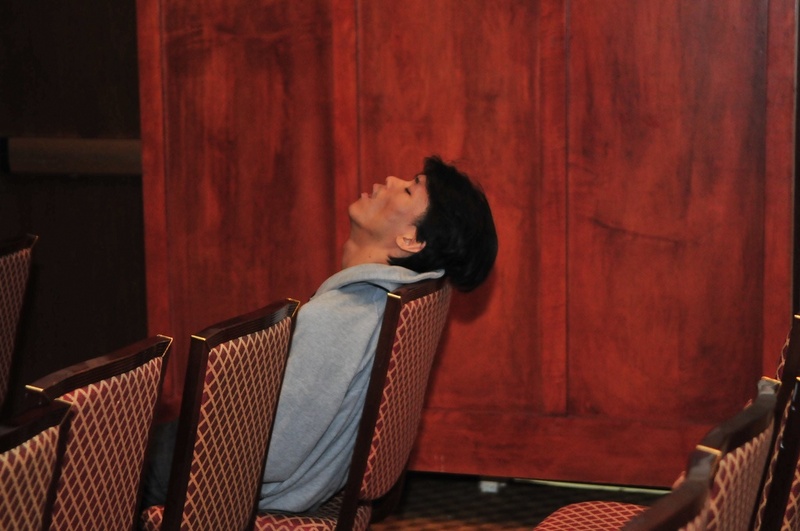 Conference tip 4: pace yourself. I find the concentrated listening required for a bunch of useful papers is really tiring. The Wednesday afternoon track that I chose was well worth the effort. The most useful papers for me were on on falling response rates (qualitative response rates are getting close to the 2% that is such a problem with quantitative), the ‘professional respondents’ who claim to be, say, 35-year-old purchasers of the Daily Mail one day and 25-year-old purchasers of nappies the next, and four people’s ideas on how qualitative market researchers could apply their skills to other types of work. But I really didn’t want to start again at 9:00am with another set of concentrated listening. Instead, I enjoyed a nice walk along the Birmingham canals and felt refreshed and ready for the next track. Conference tip 5: don’t worry about the incomprehensible paper – try reading it later. The Thursday morning offered a terrific selection of material on difficult-to-research groups such as people with learning difficulties and substance abusers. It also offered a paper on two proposed new satisfaction measures: subjective well-being (SWB) and Everyday Quality of Life (EQL). Listening to this reminded me of happy moments at BHCIG conferences trying to hang in there with John Long’s papers: lots of words, many of which seem familiar, so why can’t I make sense of it? Now, where’s that CD-ROM? Conference tip 6: learn something! The Thursday afternoon papers had three new ideas for me: the concept of using archetypes from storytelling to create brand myths, the thought that maybe we should be researching ‘persuaders’ who disseminate ideas rather than ‘typical’ users, and a fun exercise that worked with a big group (over 200 people). Conference tip 7: speak to your title. One paper was called ‘What do planners do anyway?’ and I thought: yes, what do they do? (These being advertising agency planners.) Might be useful to find out. Well, I didn’t. Still no wiser. And what did all this have to do with usability? I had hoped to encounter a few other people who were interested in usability, maybe even some market researchers who had added usability testing to their repertoire. If they were there then I didn’t find them. Anyone care to join me in suggesting a paper for next year? Because this year’s conference was good value, and they seemed open to new ideas. This article first appeared in ‘Caroline’s Corner’, in the March 2003 edition of Usability News.